call to your door, equipped with loads of experience, honesty and a desire to help. Contact James @ 07531984173 for a free estimate or a quick response to an Oil supply needing Bled or an Emergency leak, heating or electrical fault. We are OFTEC trained Oil Boiler Engineers with over 25 years of job repairs and installations to rely on. We not only plan and install bathroom suites and shower trays with associated tiling/pvc but we also repair and install electric showers at competitive rates with no call out fee. Your Heating, Hot Water or Oil Boiler problem can be repaired and resolved the same day. 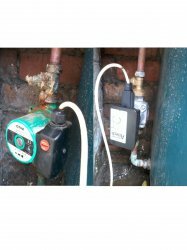 And as Master Plumbers we solve other unrelated problems caused by faulty Time Clocks, Programmers, Motorised Valves, Thermostats, Circulation Pumps, Immersion Heaters and Oil Boilers. Serving the Belfast, Lisburn, Glenavy, Crumlin, Holywood, Four Winds, Glengormley, Carryduff, Newtownabbey areas for over 20 years. We will not charge you for our call out and will provide a free no obligations quote for the repair or new installation.